The grandfather of the modern slots, the Liberty Bell slot machine, was developed in California in 1887. Since then the basic premise has stayed the same; three reels, multiple prize symbols per reel, one lever to spin the reels. Originally payouts were given as complimentary items by the bars they were in but as electronic parts replaced the mechanical parts, slot machines started paying out hard cash. Even with that development, the basic idea and design of slot machines didn’t really waver, that is, until the mass-producing of microchips and the widespread use of computer software. 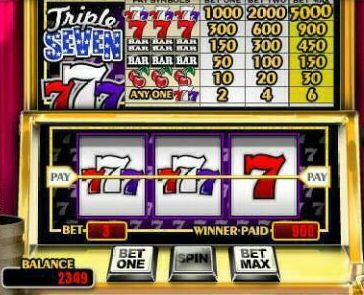 With the proliferation of the micro-processor, most modern slot machines became software based and play like a complicated computer video game. As a matter of fact, I see modern slot machines as the newer cousin to the upright arcade video game. My formative years were all up and down the ’80s. I loved video arcades. My friend Steve and I would search out video arcades in which to play our favorite games like Pac-Man, Ms Pac-Man, Super Mario Bros, Zaxxon, Tecmo Bowl, Street Fighter II, Mortal Kombat, etc, etc. I am, a video game phreak…..a Super-Phreak, if you will. So it should come as no surprise that I am fascinated by the new virtual slots seen in every casino. Not only do they look and play like a video game, they have graphics, sounds and images from popular entertainment like TV and movies. The old 3 reel system has been replaced by virtual playing reels running between 30 and 50 paylines that a user can select. The software and intelligence to run these machines has become intensely complicated. Click here for a really good interview with Michael Shackleford, The Wizard of Odds. He is a slot machine designer and he de-mystifies some ideas you may have about the One-Armed Bandit. I’ve been to many different casinos in several different places over the years. Las Vegas, Albuquerque, New Orleans, Atlantic City. During my travels I’ve seen some pretty cool and pretty funny character based machines. I began taking pictures and collecting some of the best. In this 2 part article I’ll show you some of my favorites. 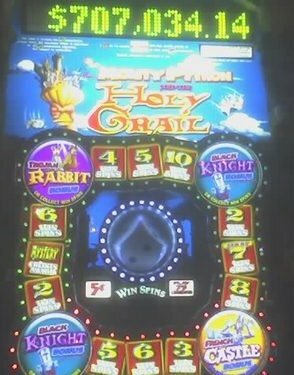 Monty Python & Holy Grail – This is easily one of the best machines I’ve ever played. The graphics and gameplay were phenomenal. I actually didn’t care that I lost 20 bucks playing on it. There are tons of movie clips and quotes that are thrown about you. If you touch certain parts of the screen neat sound effects go off. Lots of fun and one of my favorites. Click the image for a larger pic. 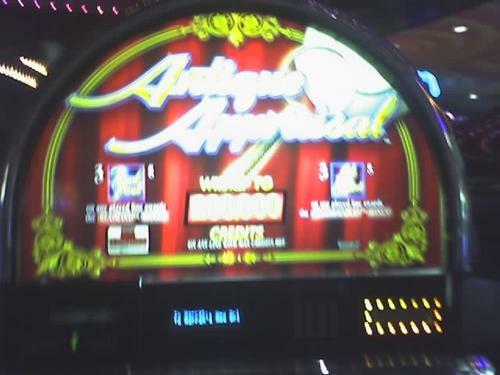 Antique Appraisal – Very interesting slot machine based on the popular tv show Antique Roadshow. The money reels have pictures of appraisers and antique objects on them. So you could conceivably get a pasty-faced man with professor glasses in one reel and a beat up looking armoire in another. The bonus game is interesting too because you have to pick out the most valuable item from a group of antiques. Very wierd premise for a slot machine, but very interesting. 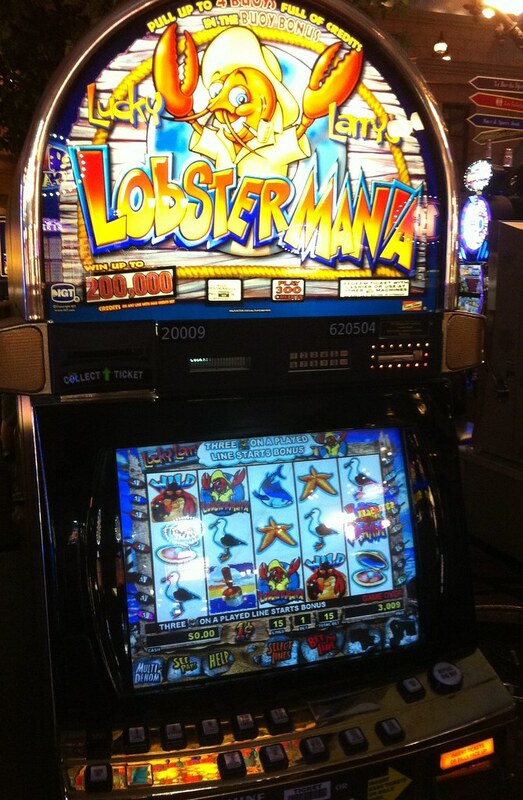 Lucky Larry’s Lobster Mania – This machine rocks. The idea of a slot machine based on the continuing adventures of a lobster by the name of Lucky Larry is patently absurd, but I LOVE IT!!. This typifies many of the silly generic slot machines you will find in big groups on the casino floor, but it’s very cleverly done. Cute characters, lots of colors, subtle theme of one being lucky or having lots of money. This one really makes me laugh because the idea is so random. Elvis – Being a huge Elvis fan, I had to put this. These are slightly disappointing because they are the old-school three reel slots and not the virtual video game slots. 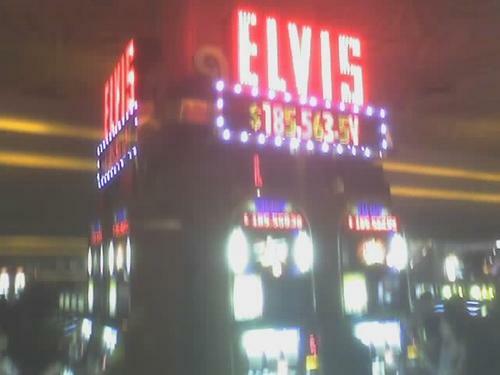 They have Elvis images all over them and some of the reels have guitars and cadillacs on them. I only played about 5 bucks on these because they are labeled Elvis, but the Monty Python slots above were calling my name. That’s about it for today, I’ll post more pics of my favorite slot machines soon. This entry was posted on August 20, 2006 at 6:02 pm and is filed under casinos, Elvis, slot machines, technology, video games with tags casinos, Elvis Presley, Monty Python, movies, slot machines, video games. You can follow any responses to this entry through the RSS 2.0 feed. You can leave a response, or trackback from your own site. Great info and photos, im working on adding photos of machines to my site also. My favorite machine is Antique App so I thought it was funny you would have that one. Laptops will revolutionize the country when they are accessible to everyone financially. Think of every man and women, having a personal laptop. Hi there may I quote some of the material found in this blog if I reference you with a link back to your site? my sister is an addict on Slot Machines, she always play any kind of game on the slot machine ‘`. papers but now as I am a user of web therefore from now I am using net for articles or reviews, thanks to web.